Every weekend, I get sent results and reports from sports that rarely get coverage in the sports pages. As someone who is interested in a wide variety of sports, have decided to experiment by publishing a round-up each week (in alphabetical order). So if you want results from YOUR sport included, give me a shout – variety is the spice of life! Big news is the win for Arthur Lanigan O’Keeffe and Natalya Coyle in the relay at modern pentathlon’s World Cup in Sarasota. Also: gold and bronze at European Rowing Championships; see below. 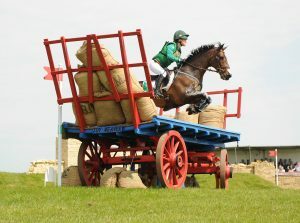 Ireland’s Camilla Speirs and her Irish Sport Horse, Portersize Just A Jiff, finished ninth at the Badminton Horse Trials in England. After a clear cross-country round on Saturday, the Irish pair were lying 17th going into Sunday’s show-jumping. A perfect display moved them up to ninth on the leaderboard. In 2010, Speirs and the diminutive Portersize Just A Jiff hadf inished 14th in the competition. Mullingar-born Joseph Murphy finished 28th with DHI Topstory, and 40th with his second mount, Sportsfield Othello. Limerick’s Michael Ryan and Ballylynch Adventure finished 30th , while Sarah Ennis and BLM Diamond Delux came home 34th.Germany’s Michael Jung, riding La Biosthetique Sam, added the Badminton crown to his World, European and Olympic wins. CORK-born Billy Twomey riding Diaghilev has won the Hamburg Derby in Germany after a jump-off. With no clear rounds, the nine horses on four faults battled it out against the clock for the placings.Twomey and the 13-year-old gelding Diaghilev jump clear second time out and their time of 49.96 seconds proved untouchable, leaving Twomey to collect a winner‘s prize of €30,000. At Drammen’s three-star show in Norway, Limerick’s Paul Kennedy finished fifth in the feature Grand Prix with the Irish-bred mare Cartown Danger Mouse. Kennedy had finished as best of the Irish in the Nations Cup at Drammen on Friday. In dressage, 20-year-old Alex Baker made a promising international debut for Ireland at the Young Rider show in Segovia, Spain, where he finished third spot with the nine-year-old mare Nibeley Uj Lady Lara. Natalya Coyle and Arthur Lanigan O’Keeffe have won the relay at the World Cup final in Sarasota, USA. The Irish pair were lying third after the fencing, swim and riding but pulled away for victory with a superb time of 10 mins 56 .32secs in the combined run/shoot. Second were the Belarus pair Mikalai Hayanouski and Katsiaryna Arol, who had taken the win ahead of the Irish last year. A day earlier, Coyle finished 18th in the women’s competition, despite getting a particularly difficult horse in the equestrian stage that left her lying in 26th position. Her combined run/shoot was the 13th fastest of the day and pulled her back up to 18th place. Nicole Turner, aged just 13, won two silvers and a bronze medal at the IPC European Open Swim Championships in Funchal, Portugal. Her silver medals came in the SM6 200m individual medley and 100 breaststroke; she won her bronze in the 50m butterfly. In total, there were 23 personal bests for the young Irish squad. 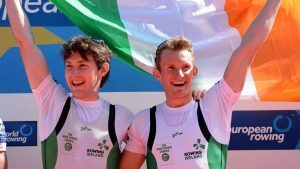 Paul O’Donovan and Gary O’Donovan took gold in the lightweight double sculls at the European Rowing Championships in Brandenburg, Germany. The pair came through in the final quarter to beat pre-race favourites Norway. In the women’s singles sculls, which is an Olympic event, Sanita Puspure took bronze behind Magdalena Lobnig of Austria who won by almost 17 seconds. Puspure was passed for second by Elza Gulbe of Latvia when she missed a stroke in the closing stages of the race. Fourth was double Olympic champion Ekaterina Karsten. Finishing fourth in their A finals were the lightweight men’s pair of Mark O’Donovan and Shane O’ Driscoll and lightweight single sculler Denise Walsh. 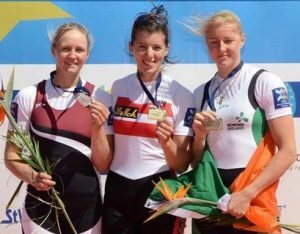 Rio-bound Sinéad Lynch and Claire Lambe were third in the women’s lightweight double sculls B final, finishing ninth overall. Men – Lightweight Double Sculls – A Final: 1 Ireland (G O’Donovan, P O’Donovan) 6:57.76, 2 Germany 6:59.54, 3 Norway 7:00.52. Women – Lightweight Double Sculls – B Final (Places 7 to 12): 1 Sweden 7:27.70, 2 Britain 7:27.99, 3 Ireland (C Lambe, S Jennings) 7:30.28. Single Sculls – A Final: 1 Austria (M Lobnig) 7:22.32, 2 Latvia (E Gulbe) 7:39.10, 3 Ireland (S Puspure) 9:44.77. Lightweight Single Sculls – A Final: 1 Germany (A Noske) 8:26.75, 2 Denmark 8:32.54, 3 Netherlands 8:37.05; 4 Ireland (D Walsh) 8:42.93. Both the Irish men and women’ teams finished eighth at the European Senior Squash Championships held in Warsaw, Poland. Playing Germany, the women’s team of Ciara Moloney, Hannah Craig and Sophie O’Roruel lost 0-3 in the division 1 5th to 8th place play-offs. The man faced Finland and lost 0-4. . Making up the team were Arthur Gaskin, Brian Byrne, Sean Conroy, and Steve Richardson. Bryan Keane from Cork finished 11th in 1:59.38 at the World Cup round in Huatalco, Mexico to keep his hopes of qualifying for the Rio Olympics alive. Keane was well up on the 1500m swim which he completed in 17 mins 46 secs and solid on the tough 40km cycle which he completed in 1:06.26. He then clocked a time of 34.13 for the 10km run. Winner was France’s Etienne Diemunsch, who finished in 1:58.23. Before the event, Keane was lying 49th on the list of Rio qualifiers with 55 places on offer. He competes in the final World Cup of the season in Yokohama, Japan, next weekend. Fred Dinsmore of Ireland took bronze in the Wheelchair 9-Ball Pool World Championships in Kielce, Poland. Winner was Henrik Larsson of Sweden with Jouni Tähti of Finland taking silver. Clare McCarthy runs 2:42.04 in Prague Marathon. Martelletti runs 73.77km in Wings for Life. Plus results.